Now that we have the general outlines of our new image, we can start painting in a bit more detail. Always begin with the element that is the furthest away (usually the sky). 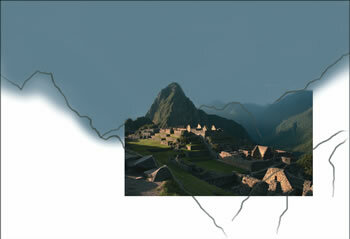 Select the ‘Background’ layer and create a new layer named ‘Sky’. 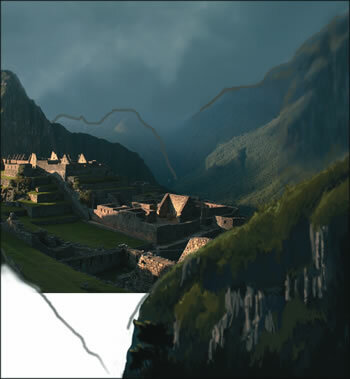 While still in brush mode, hold down Alt/Option to turn your cursor into a colour Eyedropper and select the grey/blue colour of the background mountains in the photograph. Use this colour to block in the sky. Add some storm clouds to the sky and establish the lightsource. Use a variety of different-sized soft brushes and light pen pressure to slowly build up layers of stormy clouds. Don’t forget to add the sunbeam! 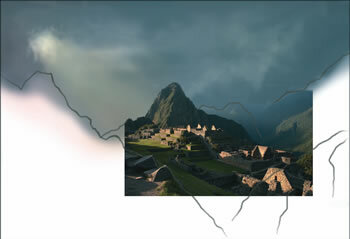 Ensure the ‘Sky’ layer is still selected and create a new layer called ‘Right mountain’. Use the same technique you used for the sky, by picking the colour of the right- hand mountain on the photograph and then blocking in that colour on your extension. Add a bit more detail to the mountain by picking various shades from the original photograph and applying it to your new layer. The sky and landscape extensions are all done from my imagination, but you are welcome to use reference photographs if that makes it easier for you. 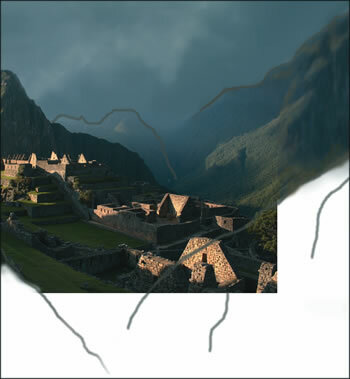 Select ‘Layer 1’ (the layer that is your original photograph) and create a new layer named ‘Right foreground mountain’. Repeat what you did in step five, but add a little bit more detail this time. Use the original photograph as your colour palette in order to keep a uniform and balanced colour scheme throughout your picture.